Stem WC may decline during the day. Zero-flow dT m increases when WC decreases. Use of nighttime dT m in the calculation of sap flux density during the day might introduce errors. 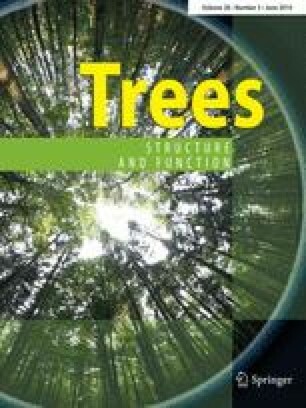 There is increasing evidence of diel variation in water content of stems of living trees as a result of changes in internal water reserves. The interplay between dynamic water storage and sap flow is of current interest, but the accuracy of measurement of both variables has come into question. Fluctuations in stem water content may induce inaccuracy in thermal-based measurements of sap flux density because wood thermal properties are dependent on water content. The most widely used thermal method for measuring sap flux density is the thermal dissipation probe (TDP) with continuous heating, which measures the influence of moving sap on the temperature difference between a heated needle and a reference needle vertically separated in the flow stream. The objective of our study was to investigate how diel fluctuations in water content could influence TDP measurements of sap flux density. We analysed the influence of water content on the zero-flow maximum temperature difference, dT m, which is used as the reference for calculating sap flux density, and present results of a dehydration experiment on cut branch segments of American sycamore (Platanus occidentalis L.). We demonstrate both theoretically and experimentally that dT m increases when stem water content declines. Because dT m is measured at night when water content is high, this phenomenon could result in underestimations of sap flux density during the day when water content is lower. We conclude that diel dynamics in water content should be considered when TDP is used to measure sap flow. An erratum to this article can be found at http://dx.doi.org/10.1007/s00468-014-1098-7. This work was supported by the Commission for Scientific Research (Faculty of Bioscience Engineering, Ghent University) and the Research Foundation—Flanders (FWO, PhD funding), granted to LLV and the US National Science Foundation, Division of Integrative Organismal Systems (Grant 1021150), granted to ROT and MAM. We thank Doug Aubrey for instruction and advice on sensor preparation. We are also indebted to Philip Deman and Geert Favyts of the Laboratory of Plant Ecology for their valuable technical support, to Anita Gijselinck for the preparation of the sensors, and to Leendert Vergeynst and Maarten Soetaert for their thoughtful comments.